If you’re looking for an elliptical that comes with all the bells and whistles then the Life Fitness X1 Cross Trainer is a smart choice. It has an advanced digital console, and the ability to select various built-in workouts and a generous stride length and whisper-quiet strides. The X1 is certainly one of Life Fitness’s most advanced cross trainers and can often be found in your local gym. With Life Fitness’s patented Link6 drive system, each stride feels natural and smooth. While the WhisperStride technology takes things one step further by making sure each stride is nearly silent. So between these two key technologies, you’ll get a great workout without ever even knowing you’re on an elliptical. In our experience, the X1 was the smoothest, quietest elliptical we had ever used. Each stride felt completely natural, and we never disturbed other members of our household during our workouts. The X1 comes with two sets of handlebars: one stationary, and one that glides with each stride. The stationary handlebars feature the brand’s special ErgoGrip, so you enjoy extra stability when performing lower-body workouts. The foot pedals are oversized, so it’s comfortable for people of all heights to use. Heart sensors are equipped on both sets of handlebars, so you can always keep track of your heartrate no matter what type of workout you’re doing. Telemetry monitoring is also available, and the cross trainer comes with a wireless chest strap. 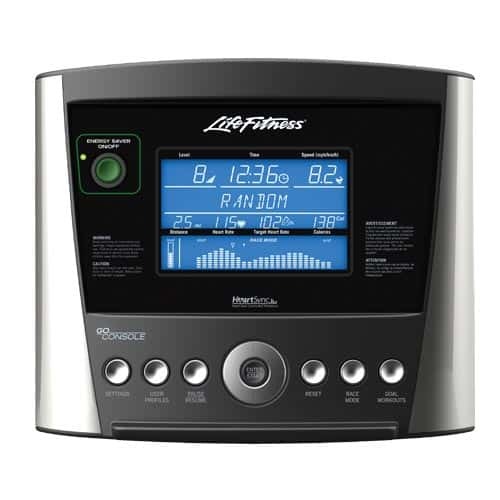 Like other Life Fitness cross trainers, this model comes equipped with the Go Console which is an advanced digital display is easy to use, and allows you to choose between 14 different workouts (12 built-in; 2 custom). You also have the option of creating two user profiles. Underneath the display, you’ll also find a number of different options. With just the touch of a button, you can switch between user profiles, change settings, pause your workout, reset your stats, set goal workouts or enter into Race Mode. The Go Console allows you to customize your workout, so you see the results you want. So if you’ve used other Life Fitness products, you’ll already be familiar with this console. You’ll find this cross trainer in many health clubs and gyms around the world because it’s durable, quiet, smooth and allows for easy workout customization. If you’re short on space or need an elliptical that can easily be stored away, the X1 probably won’t be the best choice for you. Because with a large footprint of 206cm x 77cm x 150xm, you’ll want to make sure that you have plenty of space for this elliptical. Considering that the X1 weighs 215lbs, you’ll also want to make sure that you assemble this machine where you plan on using it. 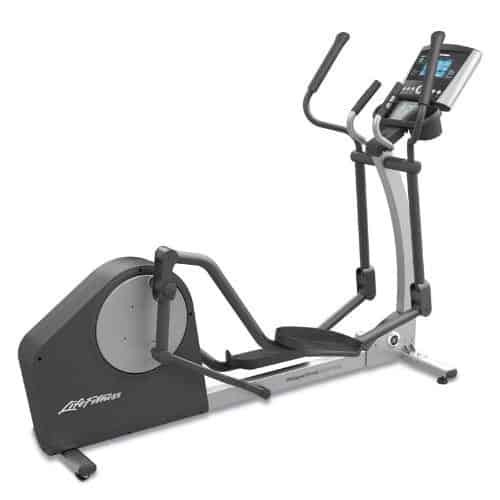 Lastly, the X1 cross trainer delivers a quiet, durable, smooth and challenging workout. With an attractive console and the ability to exercise without disturbing your family, this is without doubt an excellent cross trainer for home use.